Hey! It’s Barry. I just had to tell you about the coolest new app that I have added to my phone this year. It’s called 19 Crimes. The folks at 19 Crimes Wine developed the app for both iPhone and Androids, and as they used to say in 1783, it’s “Jolly Good!” In that year, the British government decided that anyone convicted of any of nineteen crimes (“19 Crimes” get it? ), would be packed off in a leaky wooden ship and sent to a penal colony in Australia. This was called ‘Punishment by Transportation.’ The labels of the 19 Crimes Wine bottles feature some of the miscreants who were loaded onto the boats. Serving a life sentence in Australia was considered bad. Very bad. This was way before anybody had heard of Hugh Jackman, Keith Urban, or kangaroos, so it would be like a visit to your in-laws, minus the cool accents, beaches, and shrimp on the barbie. This insane application makes four different labels of 19 Crimes Wine come alive when you hold your cell phone up to them. The wines you’re looking for are the Red Blend, Cabernet, The Banished Dark Red and Hard Chard. The people pictured on the bottle magically appear and speak to you through your phone, like some sort of 18th Century cyberghosts. They explain how they ended up ten kliks from the nearest Aborigine who was majorly triggered by giant ships bringing foreigners who wanted to steal his boomerang and Crocodile Dundee videos. Once you D/L the app, come by your neighborhood’s Broudy’s store to play with it. 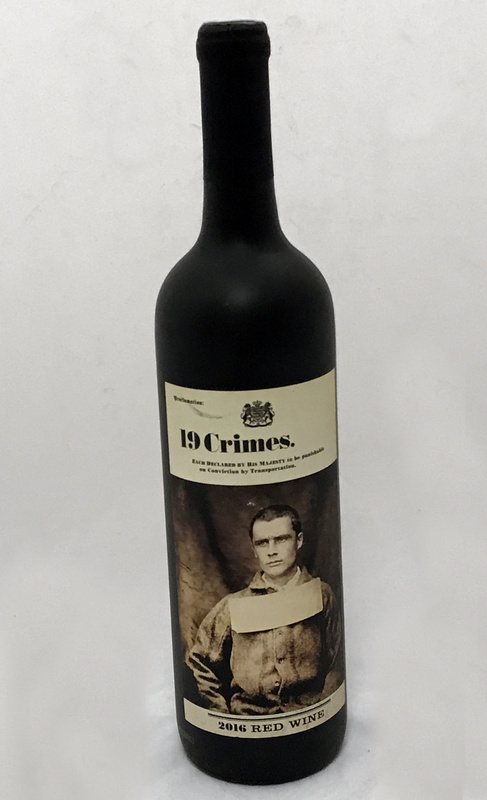 We have bottles of 19 Crimes Wine on the shelf, so you can try the app and see it for yourself. Really, the whole label-comes-to-life thing is worth the space on your phone. You’re probably going to want to take home at least one bottle to show your family and friends. There are a few different rogues with different stories, so think about getting the whole set because we have 19 Crimes Wine at a great price. Oh, bonus! 19 Crimes Wine is REALLY good.